Hi everyone, Michael here, not with a book review today. I’ve been running this blog for over five years now and it hasn’t changed much in that time. The number of visitors has steadily increased through which has been thrilling to see, but I’d love to be able to attract more people to the site and help recommend books to even more people! Therefore, if you’ve found yourself here today, would you be willing to give up five minutes of your time to fill in a completely anonymous survey on your experiences on the blog so far and its potential future. Just click the picture below to be taken to the survey. Thank you so much for helping me out and assisting me in improving my content. It’s been a long couple of months, but I’m pleased to report that my novel, The Third Wheel, is now 65% funded! That’s nearly two-thirds of the way there! Thank you so much to everyone who has pledged support so far, now I just need a little more help to push it up to the 100% mark and get it out there for everyone to read! If you pledge £10 … when the book is released, a copy will be sent right to the e-reader of your choice. If you pledge £15 … when the book is released, you’ll get an e-book edition and a first edition paperback sent right to you, wherever you are in the world. This is a limited price, with only 8 left; after that, this will be a £20 limit. If you pledge £25 … you can read with a friend! This option will ensure you get sent two physical copies of the book. If you pledge £40 … this is where things get really fun! At this level, you still get the paperback and the e-book, but you will also get some additional scenes that didn’t make it into the book that further expand the world and answer some of the questions left hanging. If you pledge £75 … you’ll receive five copies of the paperback and e-book. This is the perfect option if you want to read it for a book club, or maybe if you just need to come up with a whole bunch of Christmas presents really quickly. If you pledge £100 … you’ll get the e-book and the paperback, fine, but you’ll also get the opportunity to name one of the minor characters. Want to have your name appear in the text? Want to immortalise your soulmate? This is your chance! Whatever you choose to pledge to support me, you have my eternal gratitude and if we ever meet, you shall be hugged and thanked personally. I hope you’d like to support me in this project – how often can you help a book be born? Hit the icon below and support my novel today! English teacher Dexter feels like he’s being taunted by the universe. Everywhere he turns he’s accosted by wedding invitations, housewarming parties and tables for two. Every last one of his friends is settling down with their other halves, while Dexter spends his evenings marking schoolbooks with his ginger cat for company. The thing is, he doesn’t even mind being single; he just wishes his friends were too. After another wedding ends in a drunken disaster, Dexter is musing on the situation and wondering what he’s going to screw up next, when he gets the shocking reminder that he’s not the centre of the universe. An alien spaceship has landed on the continent and when first contact is made, it’s anything but friendly. Humanity’s numbers dwindle immediately, and the survivors are left to do exactly that – survive. Dexter gathers his friends and they all set off on a mission across the country, each with the goal of preserving their own lives in this new world. But these aliens are two-headed, tenacious and have technology beyond anything seen on Earth, so saving the day looks more and more unlikely as they track down Dexter’s motley crew. In the end, perhaps it is the one thing Dexter dislikes most that will help him survive, if he can just stop thinking about himself for one minute. Written to subvert any story that insists on including a romance subplot, as well as any science fiction story where untrained amateurs inexplicably have the right skills to save the day, The Third Wheel shines a light on those who are just trying to make it through to tomorrow in the face of overwhelming odds. But here’s the thing. I’m working with a company called Unbound this time, who used a crowdfunding model to get their books out there. I would be eternally grateful if you, yes you, would join me in this endeavour. Just click the link below to pledge your support to the project and be part of something really cool. There are loads of rewards available too, from first edition copies of the book, deleted scenes from the text, and even the opportunity to name a minor character after yourself. Click here to be part of something awesome. This isn’t a review, but I didn’t think I could let the 20th anniversary of Harry Potter pass without comment. I was introduced to the first book in 1997 by a teacher of mine. He read it to the class, and I was hooked from the opening line. It was something wonderful and new, but I don’t know if then I knew enough to be able to say that the book would still be so important to me two decades later. We all know the story by now, and the fans number in their millions. The first book alone has sold over 107 million copies in twenty years, with the series being the bestselling series of all time, putting J. K. Rowling into the list of top ten bestselling authors along with Enid Blyton, Agatha Christie and William Shakespeare. Her story is just as well known, going from writing in Edinburgh cafes (a number of which I have sequestered myself in, assuming that that’s how inspiration strikes) to becoming the first person to become a billionaire through writing books. Can I fully explain what it is about these books that is so compelling? No, I don’t think so, and I think that’s what makes them so incredible. A wizarding boarding school seems such a simple idea, and yet the books are so much more than that. Anyone who writes them off as “children’s fiction” is ignoring the fact that they open with the double murder of two young parents, leaving their baby son orphaned, and things don’t get much lighter from there. For every passage looking at silly sweets, hilarious hexes and fantastic beasts, there are discussions on society’s treatment of disability, racism, bullies in positions of authority, and it’s a world where literally anyone can die. There are better writers, there are protagonists I love more, and there are series that I’ve been gripped by, but Rowling has done something calculable here. She is a master of world building, giving us a fully realised universe, with fully three-dimensional characters, almost all with shades of grey morality. Few characters are “purely evil”, and I don’t think any are totally good. She knows everything about her world, and while some people complain about her continuing to throw new information out there (the most recent discovery being that Professors Sprout and Flitwick were once romantically involved), I’ll never stop wanting to hear it. OK, I think many of us can agree the plot of Cursed Child is perhaps something of a weak link, but no one I know who has seen it has had a bad word to say about it. More than anything, I admire Rowling for making reading acceptable. Young people seemed to have, broadly speaking, decided that reading was nerdy and uncool, but here we are with one of the biggest franchises in the world being centered around a literary work. There is little that bursts into so many different aspects of society. Harry Potter has spawned supplementary books, films, video games, websites, podcasts, board games, theme parks, a play, a whole spin-off series about a minor character, and merchandise of every stripe from wands and costumes, to sweets and cuddly toys. It is omnipresent, and there’s no sign of it going anywhere any time soon. This is a world I could marinate in for hours; it’s comfortable and warm and feels like home. And while it all happened in our heads, what’s to say that it wasn’t real? If you want to read my reviews of the individual books, you can find them here, along with reviews of related books, podcasts and films. Two years ago today I achieved a goal I’d been aiming at for pretty much my whole life – I got published. Funnily enough, my life did not immediately become one of literary lunches, drinks with Stephen King and book signing tours. I never expected it to. But the fact remains that I did something that I had always wanted to do. My book existed, an ebook, a full (if short) novel that I had written and was now out there in the public consciousness. If you’ve already bought it, thank you. If you haven’t, why not help me out and download yourself a copy. It’s available around the world on Amazon, iTunes and Smashwords, depending on what device you’re using. It won’t blow your bank account, and it’s not going to change the world, but you’d be supporting me in my work, and treating yourself to an easy-to-read tale of gods, witches, cannibalism, magic and tabloid journalism. And when you’ve read it, pop onto Amazon, iTunes or Goodreads and give it a review; spread the word and tell everyone! 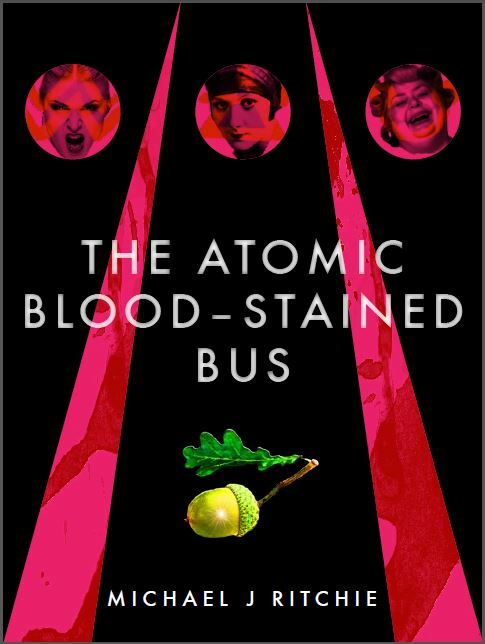 This is the story of Garfield Sutton, a cannibal who has been travelling the UK for centuries on the titular bus. It’s also the story of Algernon, an ex-god of spring who has been accompanying Garfield since the Georgian era, using his powers to help hide their crimes. It’s also the story of Gwen McKenna, a very bored journalist with too much missing in her life for her life to have any meaning, until she finds herself on the trail of missing people who were last seen boarding a bus. And it’s also the story of the last three witches of Britain, of a battle between gods, of what happens in the afterlife, and how breakfast remains the second best social lubricant after alcohol. Normal service will resume in the week – currently reading a novel about Richard Nixon – and hopefully soon some more books of my own writing will be out and about in the world. Fingers crossed, and thanks again. A year ago today I achieved a goal I’d been aiming at for pretty much my whole life – I got published. Funnily enough, my life did not immediately become one of literary lunches, drinks with Stephen King and book signing tours. I never expected it to. But the fact remains that I did something that I had always wanted to do. My book existed, an ebook, a full (if short) novel that I had written and was now out there in the public consciousness. For those interested in more of my work, a second (unrelated) novel is in the editing procress, and a third has been started. But I have no dates for those yet, so you’ll just have to sate your appetite with this one for now. I hope you enjoy it, and thanks again to everyone who buys and supports it. I hope that all my friends, followers and fans had a wonderful Christmas and I wish you all a happy and prosperous 2014. 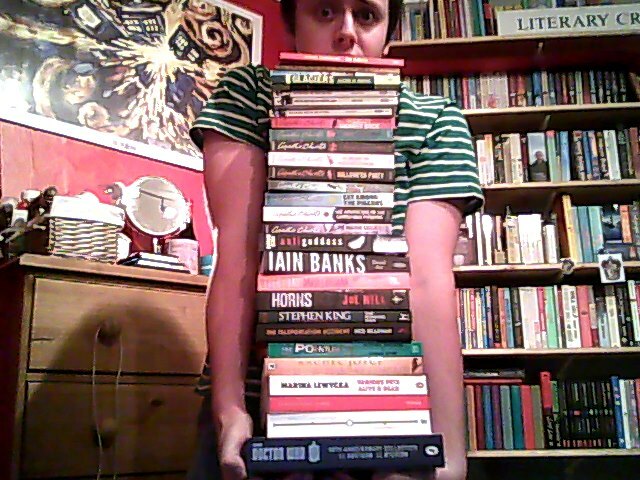 And with this stack of brand new books, stand by for more reviews in the coming year!